Recently, an operative strategy involving complete mesocolic excision (CME) and central vascular ligation (CVL) for colonic cancer has been introduced. We aimed to describe our initial experience and assess the long-term outcomes of robotic modified CME (mCME) and CVL (mCME+CVL) for right-sided colon cancer. 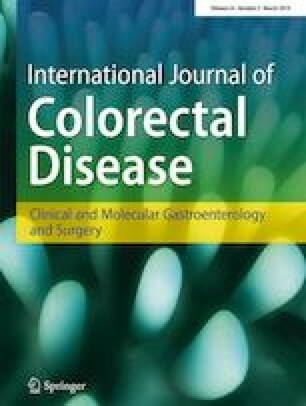 Of the 677 patients with histologically confirmed, right-sided colon adenocarcinoma who underwent curative mCME+CVL between February 2008 and October 2016, 43 who were treated entirely using the robotic approach were included in this retrospective study. Survival rates were determined using the Kaplan-Meier method, and P values of < 0.05 indicated statistically significant differences. The total operation and docking times were 293 (180–644) min and 5 (3–19) min, respectively, with an estimated blood loss of 50 (10–400) mL. The time to soft diet was 4 (1–16) days and the length of hospitalization was 8 (4–48) days. Based on the Clavien-Dindo classification, grade I, II, IIIa, IIIb, and IV complications were noted in 3 (7.0%), 5 (11.7%), 2 (4.7%), 1 (2.3%), and 0 (0%) patients, respectively. The proximal and distal resection margins were 14 (4–54) and 19 (4–48) cm, respectively, and 29 (6–157) lymph nodes were harvested per patient. The patients were followed-up for a median of 55 (2–109) months, during which the overall survival rate, median disease-free period, disease-free survival rate, and tumor recurrence rate were 93.6%, 38 (2–109) months, 81.1%, and 16.3% (7 patients), respectively. Robotic mCME and CVL for right-sided colon cancer was feasible and safe. It can be added to the surgeon’s toolbox as an optional strategy for the management of colon cancer patients. The online version of this article ( https://doi.org/10.1007/s00384-018-3208-2) contains supplementary material, which is available to authorized users. This work was supported by the National Research Foundation of Korea (NRF) Grant funded by the Korea Government (MSIP) (No. 2017R1C1B5076880). This work was also supported by the National Research Foundation of Korea (NRF) Grant funded by the Korea Government (MSIP) (No. 2014R1A5A2010008). Drs. Bae, Yang, and Min have no conflicts of interest or financial ties to disclose.